Ice dams are a common winter roofing problem that many are faced with. If the problem is ignored it can cause extensive damage to your roof, paint, gutters, interior, or dry wall. 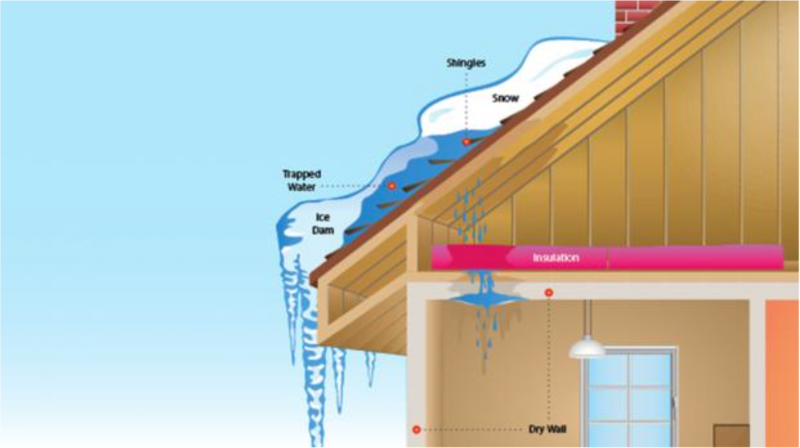 An ice dam is caused when snow melts on the upper warmer parts of a roof. Water runs down towards the colder eave and freezes into ice. The ice then accumulates which can back up under the roof shingles, where it melts again soaking the roof sheathing and often soaking into the attic. When this happens insulation is soaked and can leak through the ceiling dry wall below into your living space. Large ice dams are often heavy and can not only cause damage to your home, but they can also be a safety hazard to people. Use a roof rake during heavy snow. Blow in cold air- take a box fan into your attic and aim it at the underside of the roof where water is actively leaking in (the targeted dose of cold air will freeze the water in its tracks!). Use calcium chloride or ice melting products. Use a professional ice dam removal service. Use heated cables which clip along the edge of the roof in a zig zag pattern. Exhaust the outside- make sure ducts connected to your kitchen, bathroom, and dryer vents all lead outside through either your roof or walls, not soffit. Add insulation- additional insulation on the attic floor keeps the heat where it belongs . Ventilate your eaves and ridge- the combination of continuous soffit vent and ridge vents circulates cold air under the entire roof. Cap the hatch- an unsealed attic hatch or whole house fan is a large opening for heat to escape. March 15, 2019 Flood Risk: Here’s what homeowners can do! January 22, 2019 Why are snow tires critical for driving on Ontario roads?